Geez! That’s some (cruise) control! 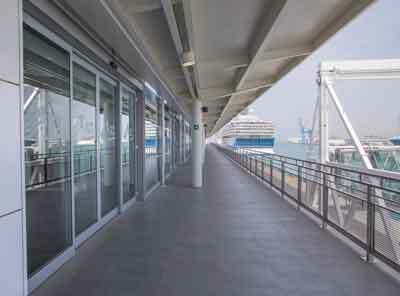 Travel in comfort with GEZE automatic doors at the new cruise ship terminal in Rome. - Support of the construction phase: Coordination with everyone involved in the building process. Cruises are increasingly becoming popular amongst holiday makers. 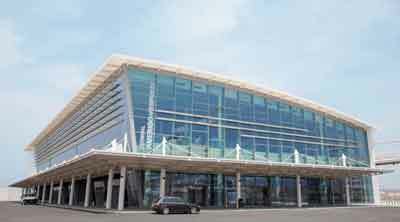 And, the new Rome Cruise Terminal (RCT) in Civitavecchia harbour has been the pick of choice. Specially built for cruise liners, it commenced operations right at the start of the holiday season, providing mooring for Mediterranean cruise liners and land excursions, offering passengers maximum comfort and convenience – even before they board ship! Europe’s most state-of-the-art cruise liner terminal was named after the legendary sailor and explorer – Amerigo Vespucci. 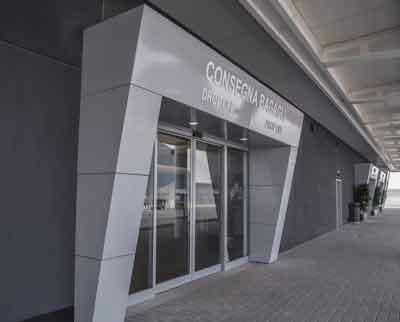 The RCT operator network (Costa Cruises, MSC Cruises, and Royal Caribbean) has invested 20 million euro in the new 11,000 square metre building. Convenient check-in is crucial for the thousands of cruise passengers, loaded with luggage, who join ships every day. Smooth handling of large numbers of passengers at the terminal entrances takes top priority. Little wonder then that the operator opted for GEZE, which has many years of experience in marine transport technology, particularly in shipbuilding. - Accessibility through automatic sliding doors. - Reliable automatic doors in salty sea air and wind. The GEZE Italia subsidiary provides excellent, cost-effective door solutions thanks to the various options provided by the automatic doors range and the team’s far-reaching expertise in providing solutions to construction projects. The requirements of passengers and everyone working in the terminal as well as the operators were considered from the very beginning. GEZE also ensured smooth collaboration with everyone involved in the building so that the automatic doors could be easily and quickly implemented. The first point of contact for passengers is baggage control on the ground floor of the terminal. The double-leaf automatic sliding doors at the front entrance are subject to heavy use. ECdrive drive systems ensure practically noiseless, automatic, and barrier-free opening and closing of the doors. - Always barrier-free and easily accessible through intelligent, digital controls and self-monitoring sensors. - Highest security standards through DIN 18650 certification. - Uncompromising reliability: A high number of movement cycles due to exceptional quality. - Individually adjustable movement parameters (acceleration, hold-open time, opening and closing speed). - ‘Break-out’: Maximum security on the escape route. The majority of the sliding doors with an escape route feature have been installed in a break-out version. In hazardous situations, additional door fittings with a rotate feature enable the door leaf to swing out manually. The turn-tilt fittings create the largest possible opening widths so that the terminal can be evacuated safely and as quickly as possible. All door drives are designed for the rigours of marine traffic, and are corrosion-resistant and waterproof while all the electronic components are concealed inside the doors. The robust and visually appealing sliding doors are also stable in high winds. The intelligent digital controls allow the ECdrive automatic doors to be networked and connected to the building technology management system. Door faults can be reported to the central location. Connection to alarm system and the emergency exit protection system allows either individual or all automatic doors to be operated remotely in case of hazards. There are 60 check-in desks on the first floor. ECdrive sliding doors allow passengers and staff to pass between individual areas and reach the terrace accessibly and easily, where passengers can enjoy a comfortable, bright waiting area with a cafeteria, bars, and a VIP lounge prior to boarding.